TePro Canvas is a popular banner sign for structures and walls, indoor hanging displays and outdoor banners and is made in very large sizes. STAFF FAVORITES "With superb sign printing, amazing vibrancy & strength, we all love the results Te-Pro banner offers our clients"
The TEPRO600 (Modern Water Repellent Canvas) is well suited to replace vinyl PVC banners and shows a higher color rating, higher vibrancy and lettering definition. 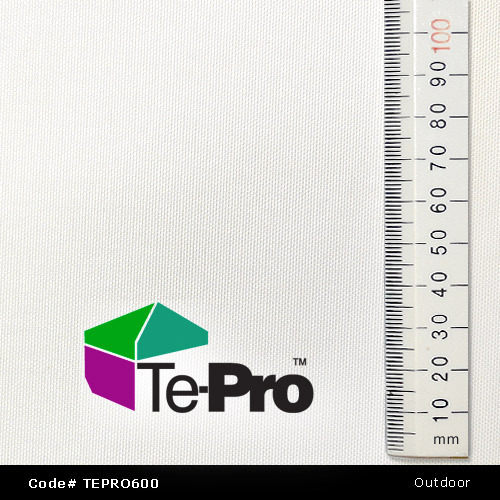 Retail designers can freely use Te-Pro for outdoor work including large banners through to interior design and canvas printing for walls, structures and panel mounts. OUTDOOR Te-Pro is manufactured for most common outdoor applications such as custom banners, stretch rope banners, front side pole banners, bleachers, tent façades, mounted wall banners etc. INDOOR Te-Pro is very popular amongst modern interior designers because its tight weave gives amazing design outcomes and the material can be wiped down with damp cloth. #1 How strong is the canvas. Heavy Duty FINE denier with aqua-phobic coating (Water Repellent). Do not iron This product has a coated water repellent surface. Folds will naturally reduce once installed. Comparison TEPRO600 is a cross weave linen pattern with water repellent coating and 60 denier loom pattern. Comparison: TEPRO600 is 126% print brightness vs vinyl. Superb blue orange magenta outcomes. Low costs and outdoor durability. Water repellent and well suited for outdoor conditions. Any Size Dimension, Any Design: #1 Size is unlimited, large or small. Events may order one (1) piece or fifty (50) pieces all custom sized to suit their applications. 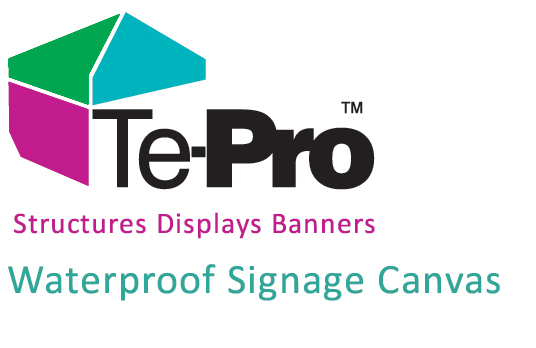 Note: Te-Pro Canvas banner is commonly purchased to suit end to end fittings such as a structure or	in between fittings, hanging heights to full length wall and outdoor banner site applications such as 2 feet, 3 feet, 8 feet, 250 yards or 3 miles etc. Order to suit your client and customize size. Canvas banner is excellent for interior designs and shopfitting panels where the 'canvas' look and feel is used for fashion, outdoor stores, fine art or rugged looks. Te-Pro is very popular amongst clients in retail and presentation. Outdoor - Canvas banner replaces many cheap vinyl prints and looks superior. Stronger and with more successful print results, canvas banner modernizes your displays. Hanging - Customer love the hanging banner style using canvas. It has visual advantages and can be sewn with pole pockets and more to make hanging an easy experience. Canvas banners can be manufactured with pole sleeves, hook n loop (Velcro), eyelet grommets and specialized features custom to your needs. 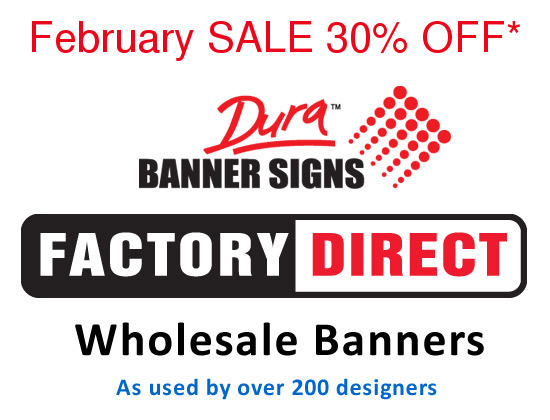 Use for Shop & Retail - Outdoor general signage, Stretch Wire or rope - Advertising banners, Indoor POP and Wall Poster, Outside banner signs and promotions, general purpose.